Ever thought about how funny mountains are? They’re hill areas. So we've made it, we've reached the half way mark of our time here! Meaning that sadly we only have 9 weeks left in this incredible place but luckily for the majority of our Arctic Scottish colony we're off on our two week jolly holidays. I mean technically it's a two week reading break, but with only one assignment due in 5 weeks we thought this would be the perfect chance to do more exploring and soak in more of the beautiful views before the dark season creeps up on us too much! 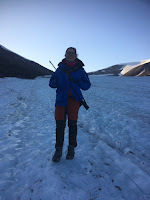 Thanks to UNIS and they're helpful logistics department, we were able to borrow anything we needed, including our groups rifle (for polar bear protection not for selfies) and start planning all our hikes. These two weeks off also gave some people a great opportunity to have some of their families visit bringing great care packages filled with food, and an even better opportunity to show off about all the amazing things we might have actually started to take for granted here, such as walking on a glacier. 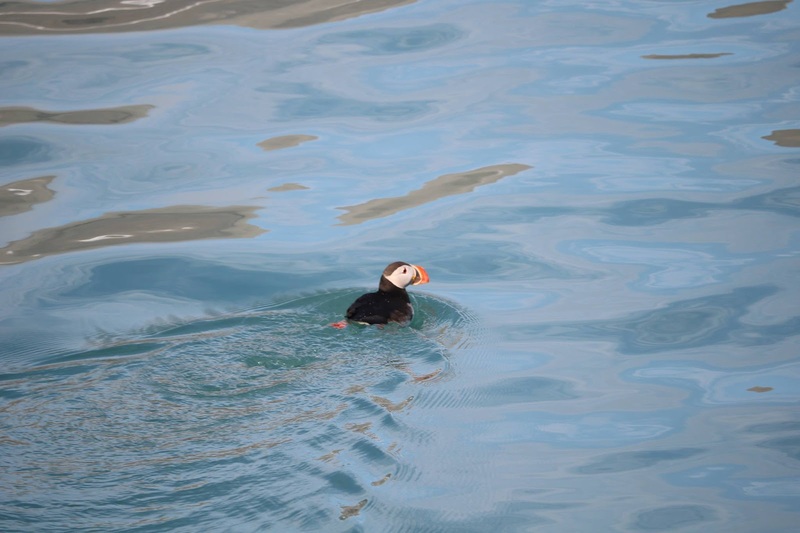 Never would have guessed that would be a regular thing to do, but a Svalbard life is no ordinary life. The first one to leave for a hike was Fred. 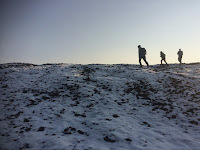 As part of a group of four, he went on a three day hike to Colesbukta. It took about eight and a half hours for the about 27 kilometres. The old, but amazing Russian cabin was a great surprise after the long and very wet hike. After arriving there the stove was lit and fed with Russian coal, which was collected along the old train tracks from Grumant to Colesbukta. On the second day the ruins of Colesbukt or Grumant harbour were explored and we tried to get over to the other side of Colesbukta, which was impossible due to the heavy rain and the river carrying to much water. On the third day we managed to hike back in first perfect conditions, until very thick fog limited the sight and orientation became quite hard. We made it home safe anyway and had a nice post hiking dinner at a local pub. 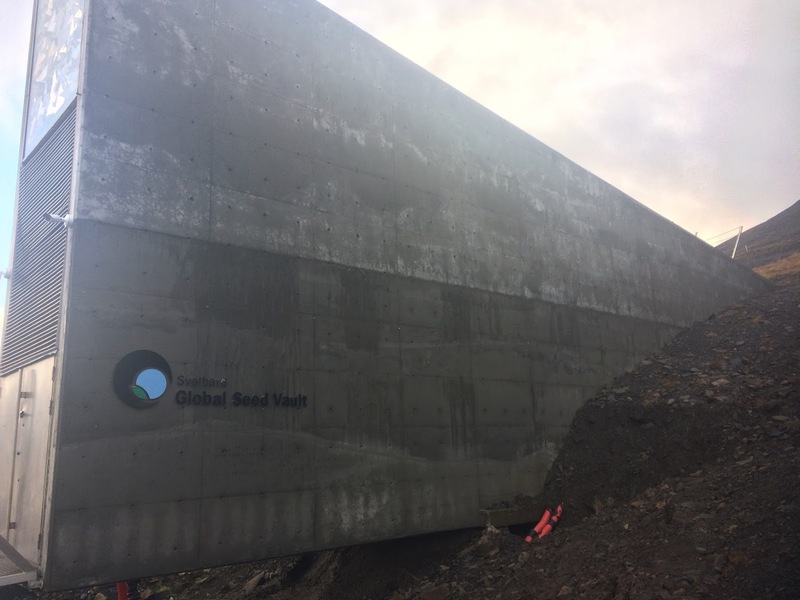 Our first wee donder for Vicky, Hope and Sally was out to the Global Seed Vault, an ultimate back up plan of 2.5 billion seeds from 4.5 million crop varities from almost every country in the world. We decided to have our lunch and vaults door. Luckily we hung around long enough to see the inside, some very important people came past while we ate our chocolate and being our normally nosey selves we had a quick glance in, just a little, of this planet saver. 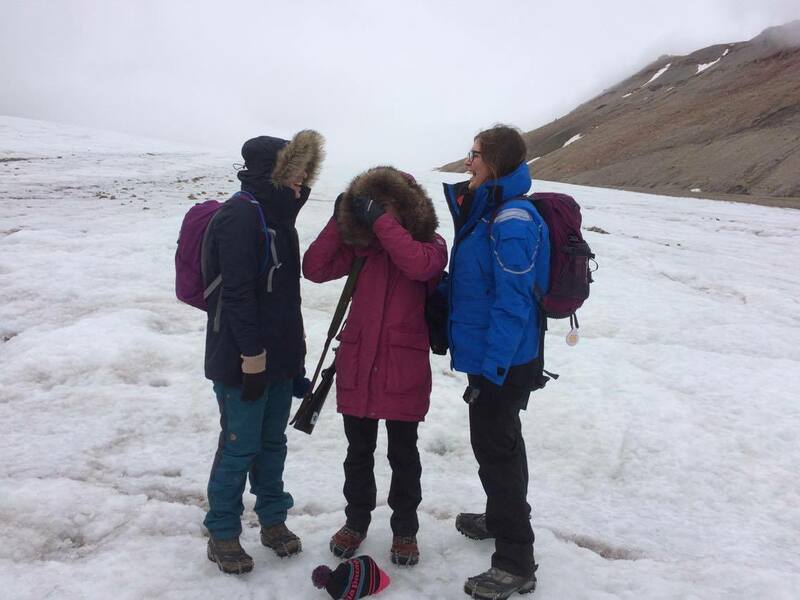 Our next little hike was out to Longyearbreen to show Chris, Vicky's boyfriend, the glacier and maybe spot a few fossils. Sally and Hope interchanged there days out with attempting to do the essay, while Fred and Vicky had loved ones to entertain. 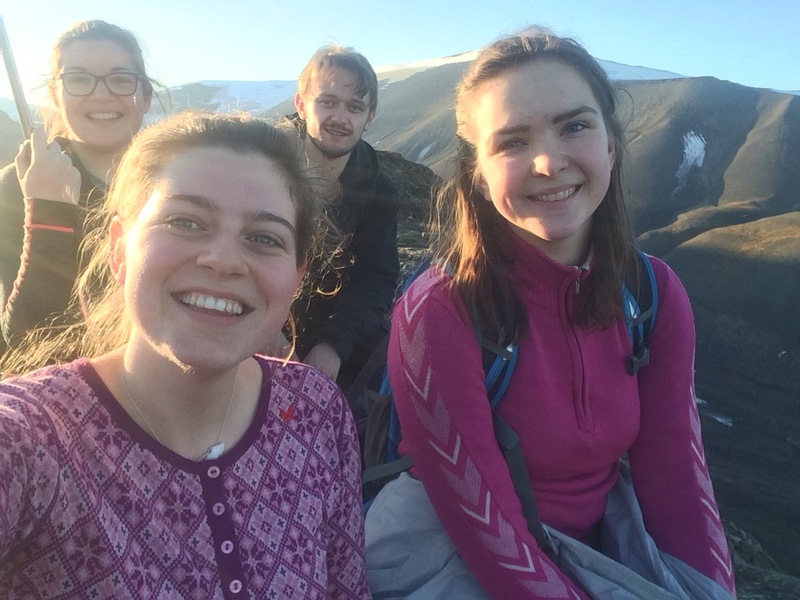 Another beautiful hike was to Sarkofagen where we went over every type of terrain from glacier to moor to rocky plato, luckily for us though the sun was shining just on the horizon giving us one last chance to eat our sandwiches in the sun. 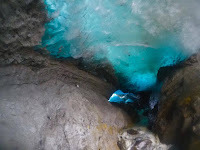 We discovered an ice cave and one of the deepest melt water channels so far. As always we had to stop off at the shop before returning home for some much needed cookie replenishment. A good thing about Longyearbyen there always seems to be something on; so half way through our holiday (reading weeks) OKTOBERFEST came to Longyearbyen. It was a three day event and we chose to partake on the second day. It was an experience! It was a very unexpected mix of lederhosen's, beer and what sounded like scottish ceilidh music but Norwegian style. After getting ready the normal student way; taking way too long and with a few cheap ciders in hand, by the time we eventually turned up the party had definitely already started and within 10 minutes of being there we were already told we had to stand on the tables and attempt to sing along. Overall it was a very fun night meeting lots of great people, each with their own polar bear encounter story, and best bit of all for Sally and Hope was the first bus ride up to Huset (our local version of Skip). Towards the end of our two weeks off a group of us decided that a night away in a cabin would be good (Procrastination Alert!). 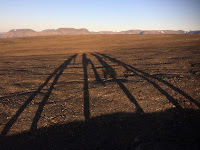 Our plans were met with a few obstacles, apart form the fact that it was a very spur of the moment trip. The initial plan was to follow the road out past the airport and go to Bjørndalen but we were told that the student cabin in the area had burnt down (just our luck! ), so on to plan B which was Todalen. We knew there was a cabin there we just had to find out how to rent it; so after a few different phone calls and a taxi to the start of Todalen (we were kinda running out of day light) we were on our way! After a slippery 4 and bit hour hike we reached our adorable home for the night; we got a fire going and got our dinner cooking (pesto pasta, a student dietary must). We chatted the evening away trying to remember the name of one of the desperate housewives (it was Lynette btw) and then got settled in for the night. 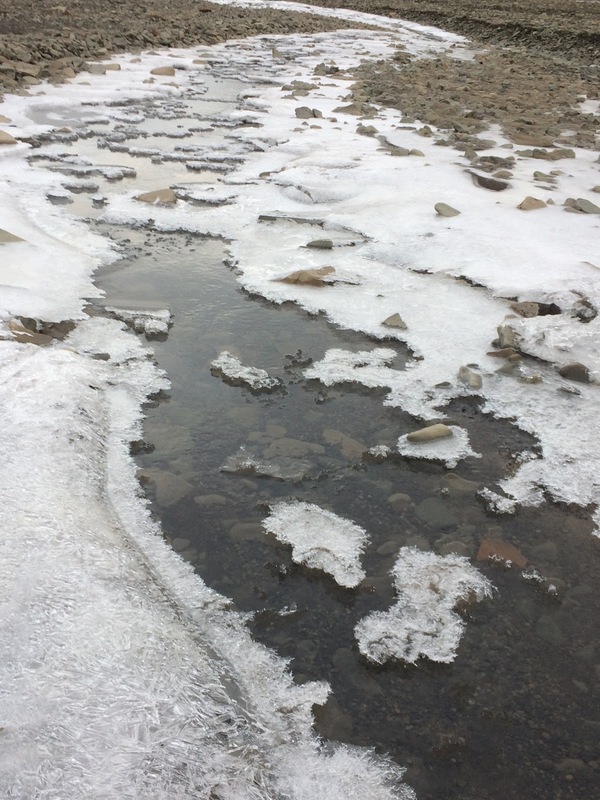 The next day was beautiful and frozen we made good time on the hike back, mainly sticking to the river bed so we could play on the ice. Northern lights and work, work, work! Recently the workload has increased significantly with reports, presentations, seminars, lectures and reading scientific papers taking up a huge amount of time. However, I did have a chance to get away from the books for one day in the last 3 weeks to do a short hike up one of the local mountains. It was great weather all the way up and we had some amazing views from the summit. It was nice to get outside for a change. The nights here definitely are getting longer and the snow is beginning to stick in the town, winter is definitely on its way! With the increased night there is an opportunity to see some northern lights. Usually they have made an appearance around 1-2am in the morning which is a good time for a lot of us on my course as we are still up doing the course work and usually need a break by then! This was the week of analysing all the data from our field trip as well as getting to grips with the R statistics program. It is a bit like the MATLAB that we use at SAMS. Thankfully my group’s analysis on our data about geese and vegetation has shown something useful, so all that is left is to write up the report and prepare the presentations that we will be delivering in the next few weeks. We also had our first “real” lecture on the second course that I am taking (AB-204) on population dynamics. We were told what we should be expecting from the course and individual projects were set which we will be investigating, writing and then presenting our work and findings at a conference in November. 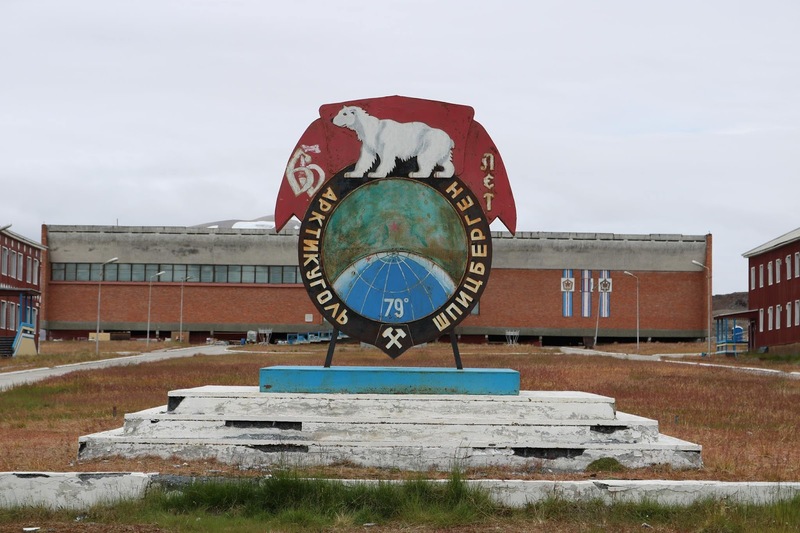 On Friday after a pretty tough week, the Friday gathering changed from its usual get-together in UNIS to a trip to Barentsburg, a Russian settlement a few hours by boat further down the fjord. 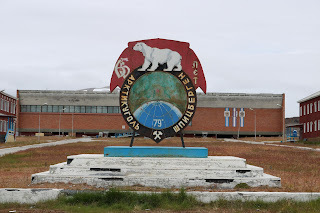 Barentsburg looked very different to Longyearbyen although it is still a coal mining town. It had a definite Russian feel. I saw the moon for the first time since I arrived and we are now getting an hour or so of darkness each night. 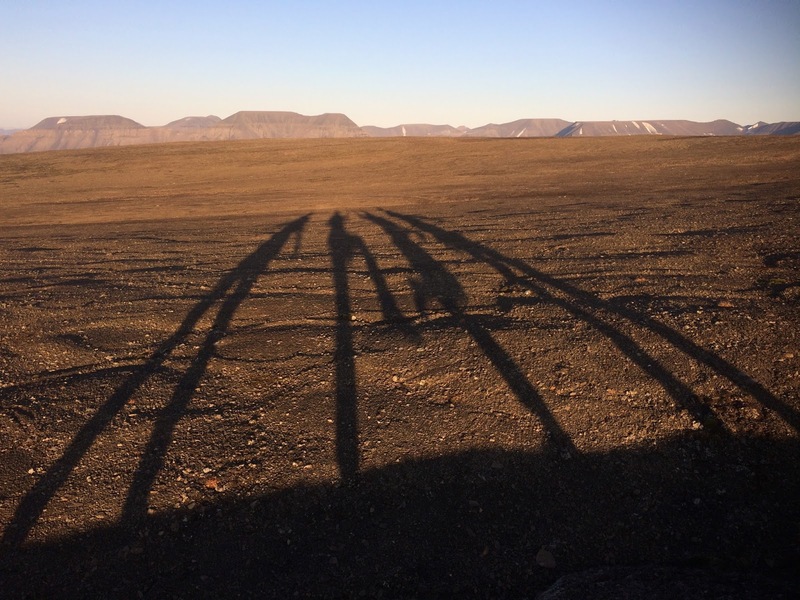 Moving around outside Longyearbyen is getting increasingly difficult because of polar bear activity. 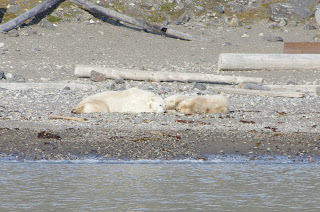 Over the last week we have had a mother and two cubs and an adult male close by. 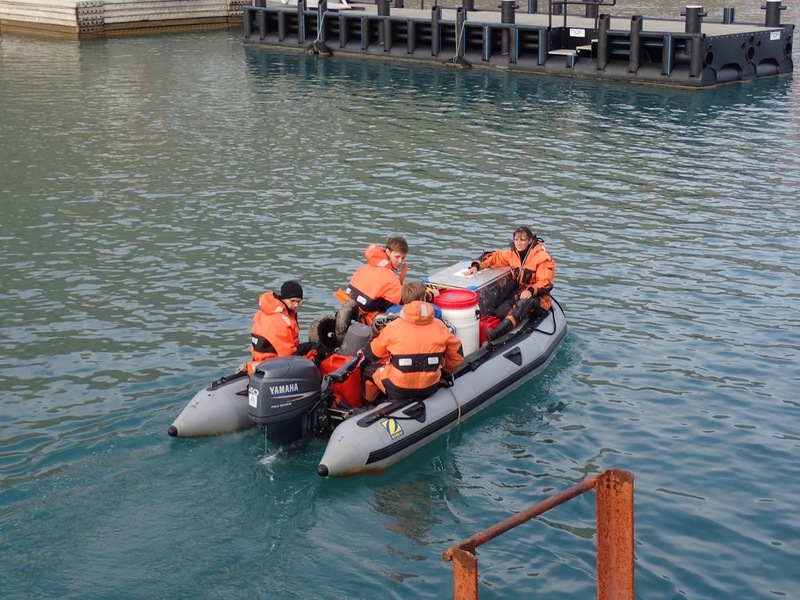 This meant that UNIS was disrupted with no fieldwork allowed in the area where the polar bears were located. 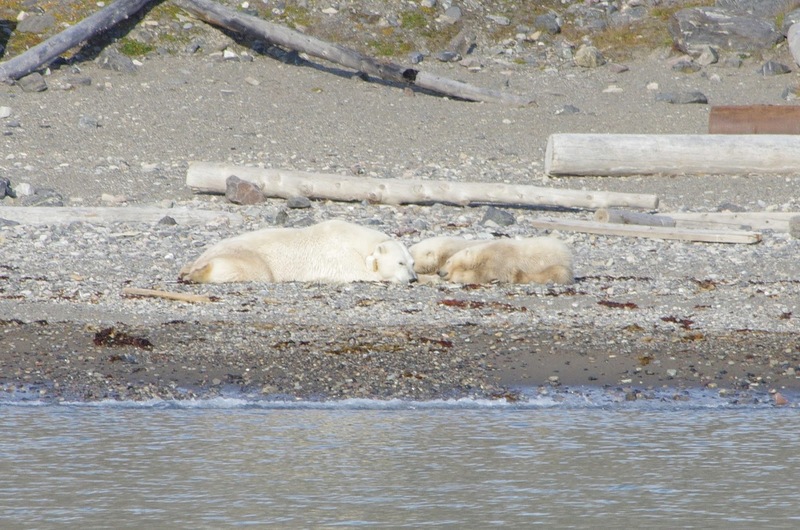 The town authorities track the polar bears and will warn if they are getting close to the town. The majority of us, apart from Mr. Terrestrial, are taking Arctic Technologies focusing on hydrology, climate change and environmental pollution. 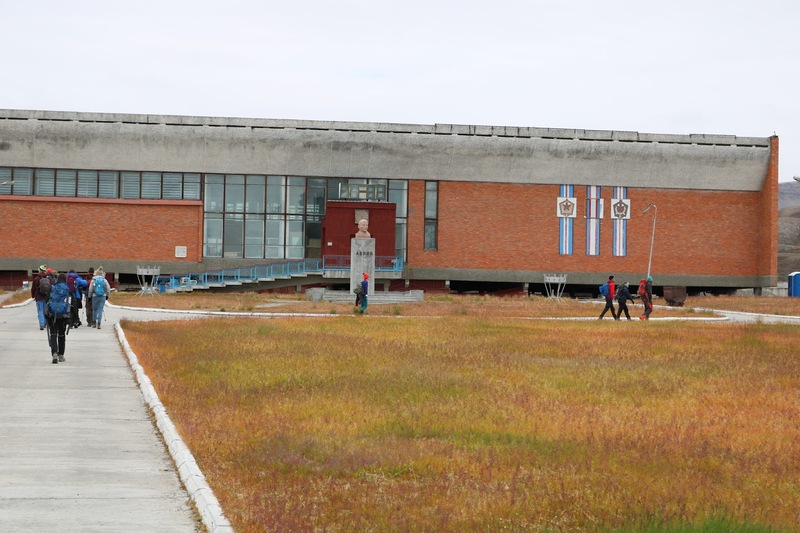 Which luckily for us included a five day field trip to Petuniabukta just north of Pyramiden! 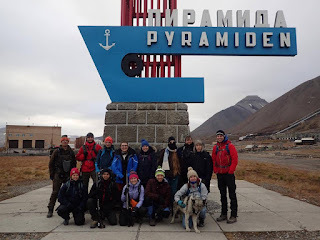 On Monday we rode the catamaran across the fjord to Pyramiden. 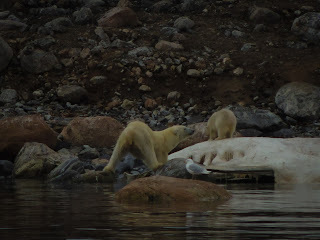 We saw sea birds, seals, 3 polar bears (mum and two cubs), and a glacier 30 to 40 meters high. 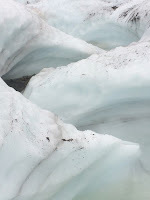 The glacier has been recorded as receding by 20 meters a year and so you can imagine the calving process is very active. 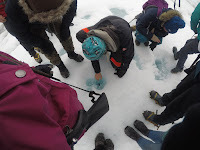 We actually saw a chunk of ice cracking off and plundering into the sea when we passed. 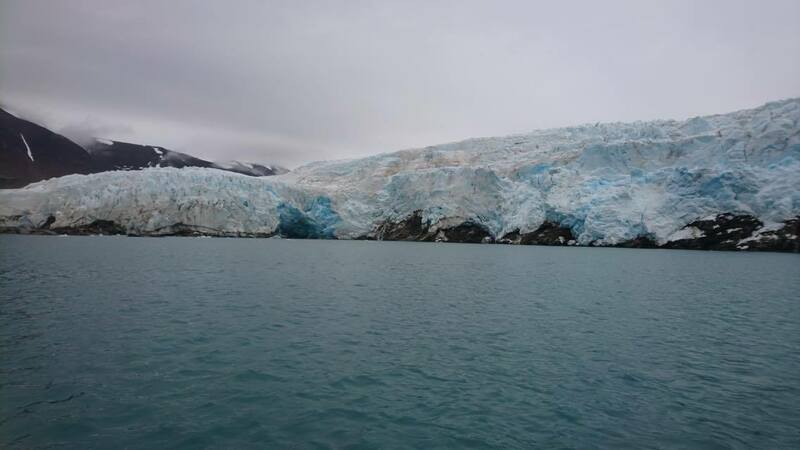 Small icebergs surrounded us in the water. We literally saw climate change! 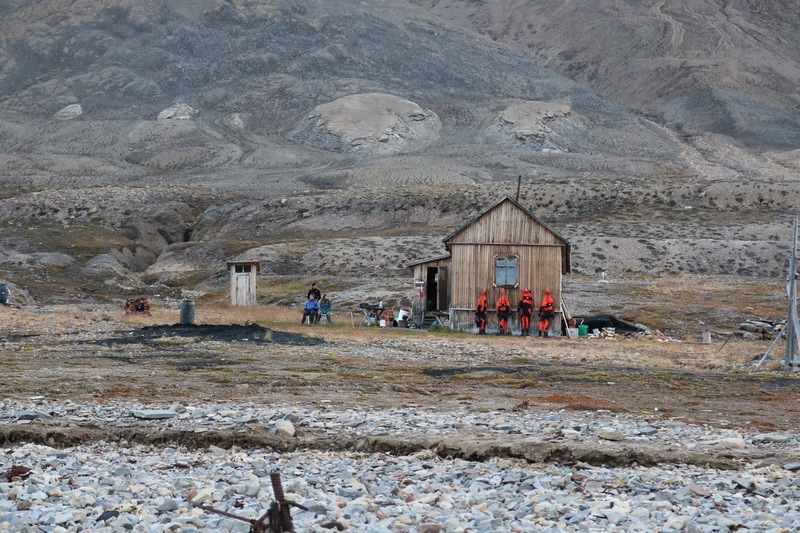 We arrived at Pyramiden, an abandoned mining town and then trekked to the Czech research cabin in Petuniabukta. Fred and three other people from the course loaded the bags, food and gear for the fieldwork onto a Zodiac and drove it (in four trips) over to the beach in front of the cabin. First thing Sally and Victoria did was check out the faecal cabin/dry toilet (a bucket). It was a tiny hut, upon opening the door we were greeted with a rather unappealing smell. Everyone was quite mentally disturbed and decided it was not for us. 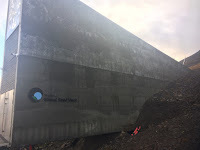 Instead most of us decided to use the much larger toilet, the Earth! Where there was plenty of rocks and amazing view over the entire fjord including the glacier. After scrambling into the bedroom and choosing who was sleeping on the top bunk we all gathered in the kitchen for Soup. Cabbage soup I think? With potato. There was definitely potato. Then we settled into bed, which was easier for some of us than others. The beds didn’t have mattresses and Vicky only had a few mm thick sleeping matt. Vicky’s night was filled with nightmares about polar bear attacks- it seems to be a recurring thing, too many talks about meeting polar bears and death seems to be the trigger. 10 hours later with two and a half hours sleep for the girls and like seven for Fred, turns out a lot of people snore. It was morning. 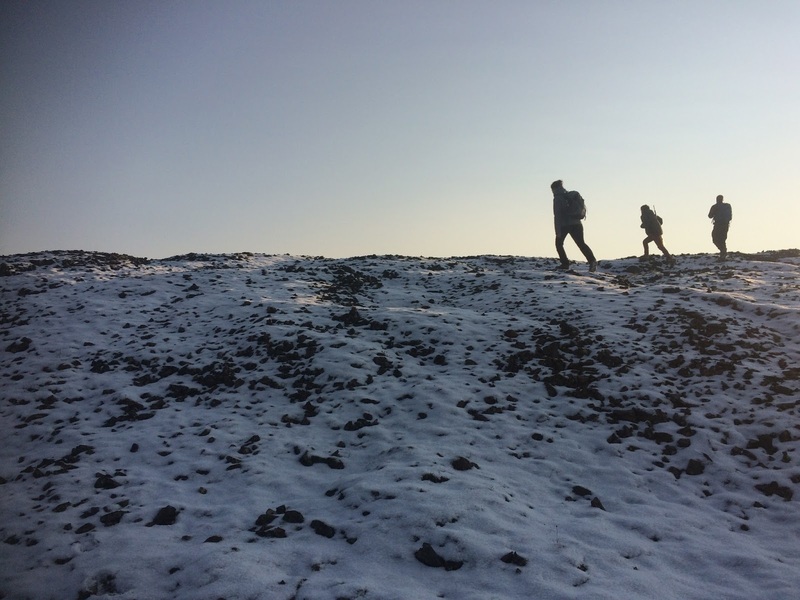 The plan was to go on a hike and check the glaciers surrounding the Pyramiden mountain. But oh my god, we were not expecting what was ahead, a 26 km hike. Hope clocked up 36,314 steps. The breakfast was at 8am but it was good, jam and butter on bread and some fruit and porridge, a good energy filled breakfast (maybe a sign of what was to come?). We set out about 10:30 trekking back to Pyramiden mining town and then started our trek on the moraine of the last mini ice age and then up on the glacier Bertilbreen. After many, many twisting ankles and sliding down the side of the valley we took a lunch stop just before getting onto the glacier. Many stops were taken whilst on the glacier, simply admiring the view, including some beautiful melt water channels. We were on Bertilbreen for roughly 3 hours trekking to the top. 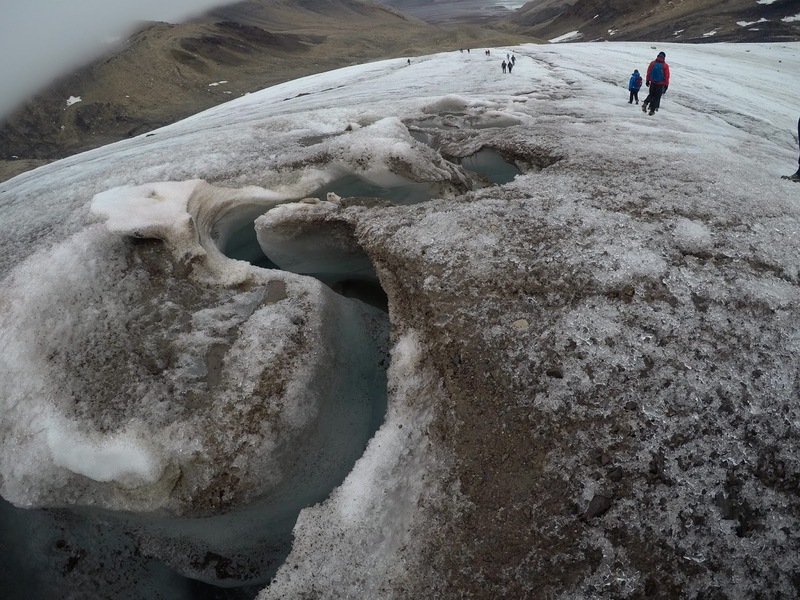 There were small holes in the glacier, called Cryoconite holes, all the way to the top with black mud in. 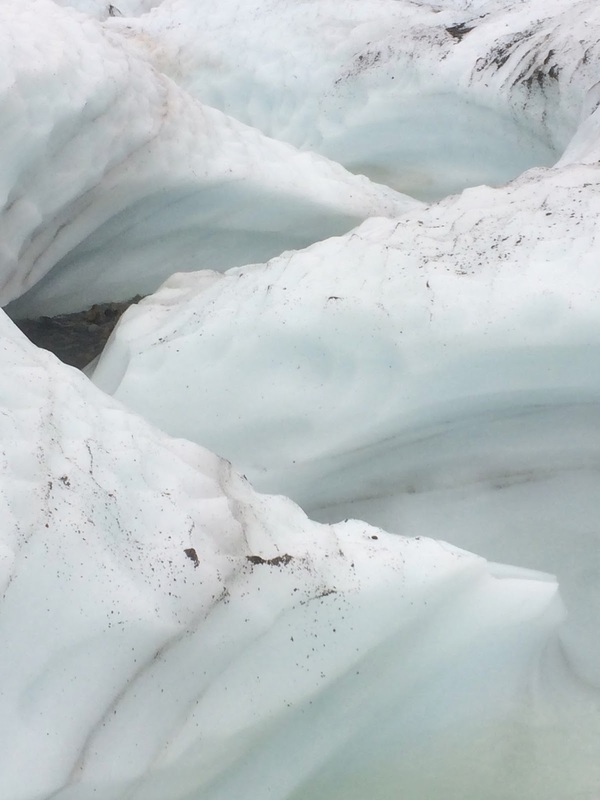 The dust accumulates and then absorbs the heat from the sun causing the surrounding ice to melt creating these deep holes were the black mud resides. 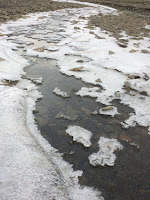 You can actually see the air bubbles under the ice on the surface of these little melt holes (SO COOL!). 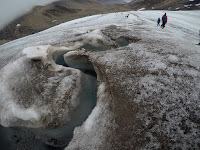 So 3 hours later we reached the top of the glacier and then walked down the glacier on the opposite side, Ferdinantbreen. This one was much more steep and ended in an even steeper hill of gravel. Everyone attempted to slide down gracefully, whilst Vicky was less graceful scraping skin off her thumb and ripping into her merino wool gloves. And Sally was greeted with a mud swamp which engulfed her entire foot which included brand new hiking boots. But all was well when we finally reached the cabin, crawling almost as we reached the last 100 meters. It was 7:30pm when we finally got back. No one even made it back into the cabin and we rather enjoyed the chilly air and the amazing view in front of the cabin. But 15 minutes of regaining strength and a loaf of bread later, dinner mostly cooked by the girls was on the stove and ready in no time and all was good again. The evening followed with a ‘Czech tradition’ some vodka shots with glacier ice for surviving the first whole day in the wild and singing to the tunes of Laura’s ukulele. We trekked to Pyramiden to the beginning of the moraine of Bertilbreen. 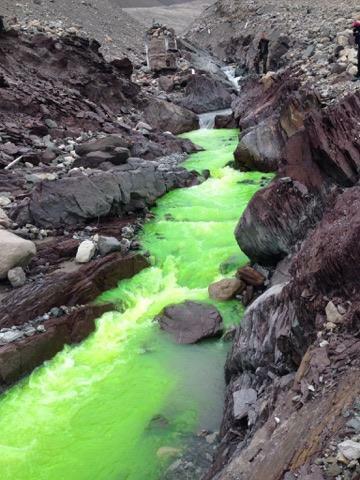 The mission was to identify how the mixing of the stream from the moraine was and to identify eddies, if any. Two types of dye was let loose in the river, one was streamed pink and the other was bright green. 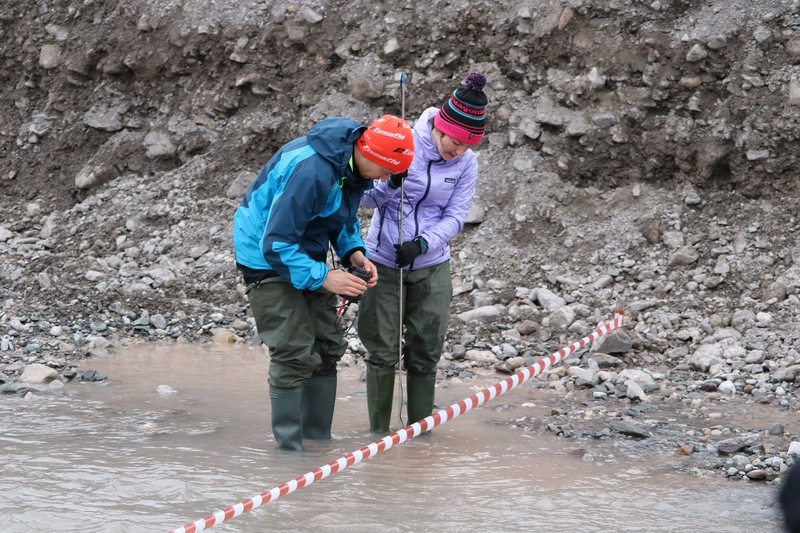 This meant we could distinguish where the better mixing areas in the stream were. Further down the moraine we measured water currents and then after freezing some of Victorias toes we headed back to camp. 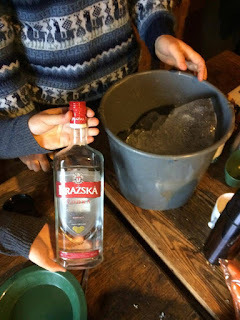 After dinner cooked by the guys (and again following the ‘Czech Tradition’ some more vodka shots) we jumped into the sea. It was the fourth day we were away and since there was no running water this was our only way of having a near bath experience. It was seriously intense and as cold as you imagine. 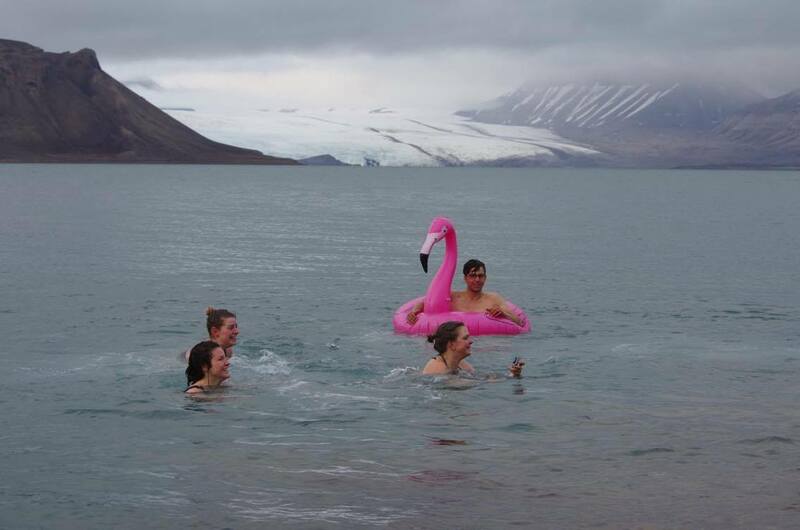 However, we were all really glad we did it, because not a lot of people can say they’ve been swimming in the sea at 79 degrees North. 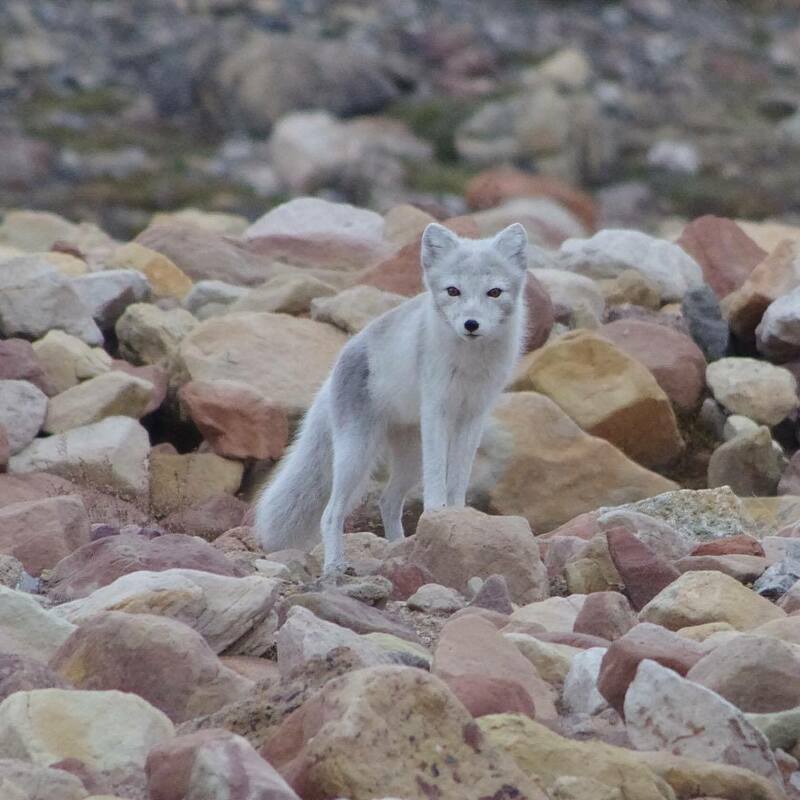 Later that night we were greeted by a polar fox. I’m not sure if it was a bark or a scream but it was definitely not what we expected a fox to sound like. The next day we focused on more field work. The measurements we took the day before didn’t work since the batteries died on the current meter. We split up into three groups, two of which went onto the beach to collect sand samples for the pollution course we are taking that we would take back to the lab and identify the amount of micro/nano plastics within the samples. 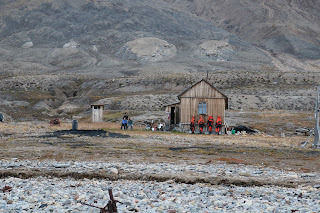 The other group was taken out on the zodiac to visit the Scottish settlement across the fjord, an old mining area that was abandoned after 3 years due to the mining not making enough money. 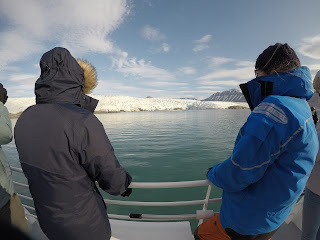 Following that was a zodiac trip to the 40m tall Nordenskioeldglacier and then a stop at an ice cave. Jan, our Czech cabin host, has been coming back to do research there for 7 years now and he told us that the ice caves we visited were 200m deep, now they have retreated to 20m. 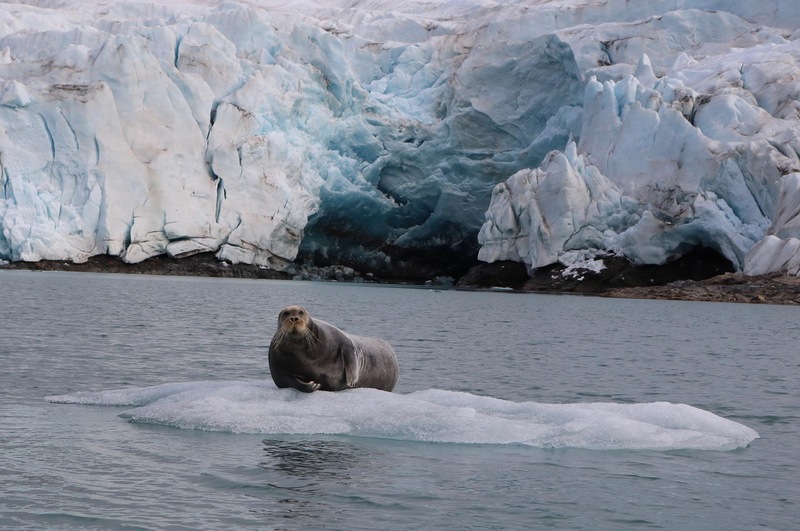 Fred saw a bearded seal on a block of ice that had melted off the glacier. 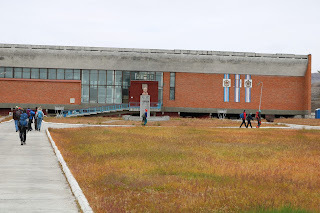 The last day we went to Pyramiden and joined a tour around the old town; learning about the people who lived there and what the town is now used for. We even took a stop in the hotel, one of the few buildings that are still in use. After that we packed up the boat and went home to hot showers and warm beds. In all we saw 4 polar foxes, 14 grouse, 3 polar bears, a seal, and many sea birds (lots of very hyper Puffins). Even though we woke up with sore feet, greasy hair and endured long days, we all had great fun and it was a great way to get to know each other. It’s something we wish we could all repeat again! 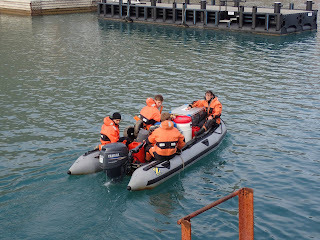 At the start of week 2 my class and I left Longyearbyen for the first time, setting out for our week long field cruse. The work took us around the west side of the island to the Island’s northern most point. 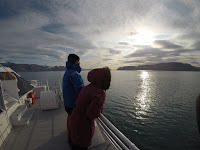 Each day we stopped off at different sites to do data collection for our group projects and in the evenings we had a chance to be on deck as we travelled seeing the landscape and some amazing wildlife. This included seeing the trip’s first mother Polar Bear and her cub on a whale carcase. 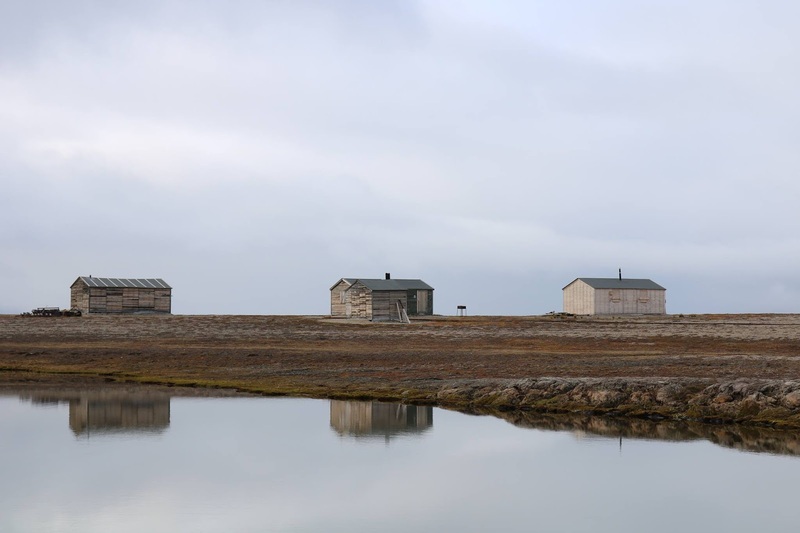 We also had some free time on the land where we were given the opportunity to do activities like the polar plunge (swimming) and or having time to do some fishing (mainly for Arctic Char). Our ship “Stalbus” was an amazing and not what came to my mind when I thought of a research boat. I guess they were easing us into it - it was virtually a floating hotel. The crew were great. They made a effort to chat to the students and get to know us, even though English was not their main language for a lot of them. They also cleaned and cooked for us each night, as well as looking after the boat. The week after the trip was filled with Lab work, analysing the samples that we had collected on the cruise. 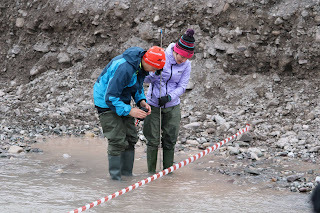 Each group had collect hundreds of samples, but we all pitched in to get the work done. Next week we’ll be using a statistic programming language (R) to analyse the data and start to write up our reports.